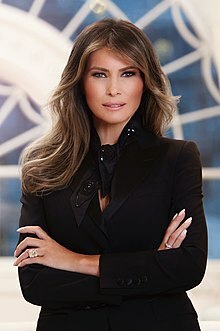 Melania Trump (born Melanija Knavs, name was germanized to Melania Knauss; April 26, 1970) is a Slovenian-American former model. She is the wife of the current President of the United States of America, Donald Trump. They married on January 22, 2005. In 2016, Trump was campaigning for her husband to become the next U.S. President when she became scrutinized when giving a speech that was allegedly similar to one that First Lady Michelle Obama gave at the 2008 Democratic National Convention. In September 1998, she met real estate mogul Donald Trump at a party at the Times Square nightclub the Kit Kat Club (now the Stephen Sondheim Theatre). After becoming engaged in 2004, Knauss married Donald Trump in an Anglican service on January 22, 2005 in Palm Beach, Florida, followed by a reception in the ballroom at her husband's Mar-a-Lago estate. She assumed the role of First Lady of the United States on January 20, 2017. She continued living in New York City at the Trump Tower with her son, Barron, until the end of his 2016–2017 school year at Columbia Grammar & Preparatory School. They moved into the White House in Washington, D.C. on June 11, 2017. On March 13, 2018, Melania Trump scheduled a March 20 meeting with policy executives from technology companies, including Amazon, Facebook, Google, Snap, and Twitter, to address online harassment and internet safety, with a particular focus on how those issues affect children. In May 2018, Trump successfully underwent kidney surgery at the Walter Reed National Military Medical Center in Bethesda, Maryland. Trump is a Roman Catholic, making her the first Catholic to live in the White House since President John F. Kennedy and the second first lady to be Catholic, following Jackie Kennedy. ↑ "Melania Knauss Biography". Star Pulse. Retrieved 2 May 2011. ↑ "Melania Knauss". Ask Men. Retrieved 2 May 2011. ↑ Krieg, Gregory (19 July 2016). "No one to be fired after Melania Trump speech plagiarism episode". CNN. Cable News Network. Retrieved 16 November 2016. ↑ Horowitz, Jason. "When Donald Met Melanie, Paolo Was There". The New York Times. Retrieved December 29, 2017. ↑ Donnelly, Shannon (January 23, 2005). "Donald Trump wedding: Vow wow". Palm Beach Daily News. Retrieved November 25, 2016. ↑ "The Donald's youngest son, Barron.". Chicago Tribune. Retrieved July 18, 2017. ↑ Schneider, Karen S. (May 1, 2006). "Billion Dollar Baby: He Has Mom's Eyes, Dad's Lips, His Own Floor in Trump Tower and Doting Parents: Welcome to the World of Barron William Trump". People. Retrieved September 7, 2015. ↑ Diamond, Jeremy (November 10, 2016). "America, meet your new first lady". CNN. Retrieved November 20, 2016. ↑ "Louisa Adams - First Ladies". History.com. Retrieved November 19, 2016. ↑ "Melania, Barron Trump to remain in NYC until end of school year". Fox News Channel. November 20, 2016. Retrieved November 29, 2016. ↑ Andrews-Dyer, Helena (November 20, 2016). "Donald Trump confirms that wife Melania and son Barron will stay in New York after the presidential inauguration". The Washington Post. ↑ Johnson, Alex (June 11, 2017). "First Lady Melania Trump, Son Barron, 11, Move Into the White House". NBC News. Retrieved June 12, 2017. ↑ CNN, Betsy Klein and Kate Bennett. "First lady touts equality at International Women's Day luncheon". CNN. Retrieved March 10, 2017. ↑ "First Lady Melania Trump Hosts a Luncheon for International Women's Day". Cosmopolitan. March 9, 2017. Retrieved March 10, 2017. ↑ Bennett, Kate (January 31, 2018). "Melania Trump Arrived at State of the Union Separately from the President". CNN.com. Archived from the original on January 31, 2018. Retrieved February 3, 2018. ↑ Romm, Tony (March 13, 2018). "Melania Trump will meet with tech giants including Facebook and Google to talk cyberbullying". Washington Post. ISSN 0190-8286. Retrieved March 15, 2018. ↑ "Melania Trump Brought Two Private Residence Staffers With Her to Bush Funeral". PEOPLE.com. Retrieved April 23, 2018. ↑ Barsamian, Edward. "Melania Trump Redefining First Lady Style". Vogue. Retrieved January 11, 2018. ↑ Liao, Marina. "Keeping Up With Melania Trump's Outfits". Popsugar. Popsugar. Retrieved January 11, 2018. ↑ "Melania Trump's kidney procedure explained". CNN. May 14, 2018. Retrieved May 14, 2018. ↑ Yglesias, Matthew (July 18, 2016). "Melania Trump, explained". Vox. Retrieved August 11, 2016. ↑ Sieczkowski, Cavan (May 25, 2017). "Melania Trump Will Be The First Catholic To Live At The White House Since JFK". HuffPost. ↑ "US First Lady Melania Trump Is Catholic, Spokeswoman Confirms". The Catholic Herald. May 26, 2017. Retrieved May 26, 2017.